Dogecoin (DOGE) is a cryptocurrency that is almost universally loved within the cryptocurrency community. Launched in 2013, this Litecoin fork was presented as a joke coin. DOGE was a big success, just like every project, made just to have a good laugh, should. Over the course of its price history, Dogecoin managed to gain a market capitalization of over 2 billion dollars. Dogecoin is to this day one of the most well-known coins in the market. Let’s talk a little about the Dogecoin success story. Dogecoin was designed using the codebase of Litecoin and its development was aimed at providing an alternative to Bitcoin. It should’ve been more approachable and friendly cryptocurrency. Its most distinct feature, however, is its mascot. The developers of Dogecoin chose a “fun” approach towards its development. The coin got a Shiba-Inu logo and the name “Dogecoin”, reflecting the internet meme “Doge”. Dogecoin was just a little changed when developed on top of Litecoin. Dogecoin vs Litecoin shows itself as an even “lighter” coin. New blocks in the DOGE blockchain are created faster than in Litecoin – 1 minute against 2.5 minutes in LTC. Today, Dogecoin’s mining difficulty is adjusted every block found and the reward is fixed. The most distinct change happened in the brand and it became a driving force behind its popularity. The fun image of the crypto helped the coin to get attention in various social media. The coin turned famous even outside of the community of blockchain technology fans. For around three years the coin was famous but not actively traded and there were no rapid price movements either. However, several charity programs and friendly community helped the coin to get the trust of the community. DOGE vs LTC transaction chart (YTD). DOGE is used more actively sometimes. The coin grew its user base with the help of the Reddit community and other social platforms. Eventually, it helped to move the Dogecoin market cap in rates not even the most bullish analysts could’ve predicted. Dogecoin market cap from its launch to this day according to CoinMarketCap.com. The trading volume grew alongside its market cap. Today, the coin is not as prominent on the market. Its price dropped significantly, and it’s market cap has also left its high point. Still, it is one of the top-30 coins on the market and overall ROI is around 350% from the first day of coin creation. It is also pretty popular crypto, despite some bearish Dogecoin projections. You can find more information about the coin on BitcoinWiki.org. Will we hear about Dogecoin rise up and what is the Dogecoin value prediction? Is it a good time to buy Dogecoin & HODL? Dogecoin had a tough bearish year. Similarly to the other market, Dogecoin price lowered by the loss of the public’s attention. Dogecoin price was in a downtrend for all 2018, despite the several times the Dogecoin price was going up for a short period of time. 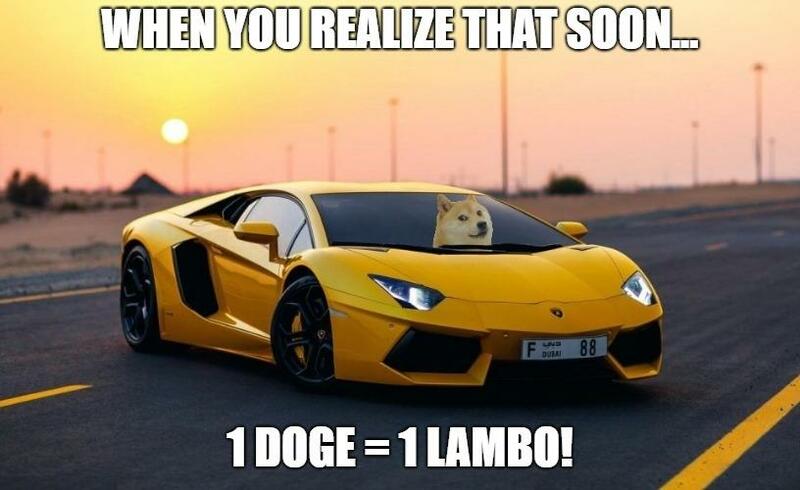 Today, long term Dogecoin forecast is not very bright. During the price falls of March, July, and September Dogecoin was falling along with the market. However, The DOGE price drop isn’t that bad as it is for Bitcoin and the price spikes after the downtrend show that DOGE was recovering faster than BTC. 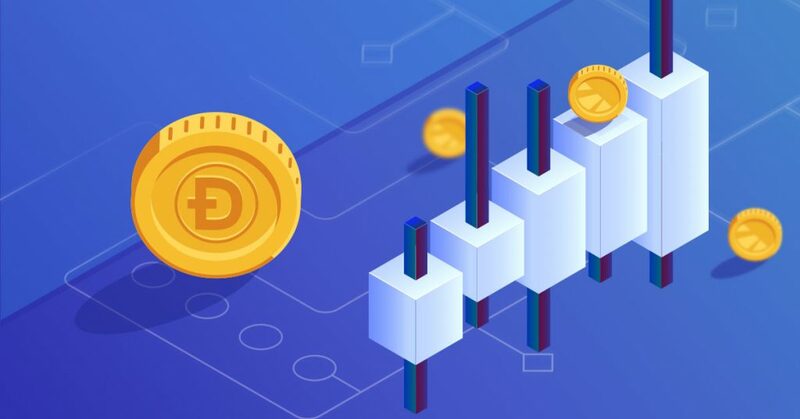 Dogecoin is obviously very dependent on the overall interest in the blockchain industry and behaves like most of the other coins, discussed the Cryptocurrency Price Predictions articles published on our website. For example, Zcash and BitcoinCash – both coins mirrored Bitcoin price graph (check out our Bitcoin price prediction 😉). Due to the fact that DOGE is so linked to the cryptocurrency market movements, predicting its price becomes difficult, especially for long term predictions. We cannot say that Dogecoin is worth buying and there are bearish forecasts on its future price. Sad, but true. Dogecoin popularity was outstandingly stable over the course of the previous year. You can see on the following graph that the coin even managed to get a search term “Dogecoin” spike in popularity. The coin was very interesting for Google users in September 2018. A couple of less significant peaks happened in July and December. And at the start of 2019, the popularity was around the same level as it was in the same period of 2018, which is a major accomplishment in terms of the industry crisis, happening today. DOGE is widely owned and the community members seek to use their Dogecoins in everyday life. Recently added Bitrefill’s AirBnB payment option is a good example. The price of Dogecoin is, sadly, not very responsive to media attention. For example, the news about Airbnb caused a price rise against USD in ~3%📈 over 3 days after the announcement. According to the Google Trends, DOGE has its committed audience and most popular in Venezuela. I’d really like to add an interactive map widget, but it would load on the page for years 😅. Similarly to Dash, DOGE turned out to be one of the go-to cryptos in countries where financial system is struggling. Other countries with a large amount of the “Dogecoin” searches include Bangladesh, Pakistan, Philippines, and Nigeria. It is a good sign that the coin is used as an alternative to the official fiat currencies of these countries for monetary exchange between regular people. Will the DOGE price rise significantly? There is a good chance it will. Dogecoin’s popularity offers the coin a large potential user base. The coin has a reasonable chance to show a price of over $0,005 USD per DOGE, more than twice its current price. If the coin manages to hold its popularity and widen its user base this way, it will surely gain a lot of value in the following year. The current downfall of the market has shown that DOGE is relatively robust and can take a hit. If the market starts an ascending trend, Dogecoin will be a major beneficiary of the uptrend and will be less damaged in the future recessions and price falls. Very long-term Dogecoin forecasts are even harder to make. Still, they are mostly positive! The coin has historic value. Alongside Bitcoin, DOGE is one of the oldest cryptos on the market. IT also has a number of positive events, connected to it. For example, the 2014 Winter Olympics fundraiser for Jamaican Bobsled Team and Doge4Water charity that helped to build a well in Kenya. Dogecoin can become valuable as a part of a collection of the most notable digital assets. Sound crazy, but some people actually think of it. At the time of writing this article, Dogecoin value is around $0,002 USD per coin. The price fluctuations is relatively stable and shows a little uptrend. Sadly, it is still very far from the Dogecoin highest price of 0,017 USD per coin. Let’s hope it will reach $1 for the start. Nothing is impossible in crypto. Dogecoin is not among the most-traded currencies. It is also not very technically-advanced. Therefore, it has no grounds to show rapid increases in price, especially the increases of such magnitude. Other cryptocurrencies, that have a predicted price rise of similar scale, mostly have either great speculative advantages in trading or a very promising future in terms of the technology behind it. Dogecoin is not that type of crypto. Even the biggest fans of the internet meme-coin are not making positive forecasts. Dogecoin has the support from Elon Musk. Soon to the Moon! You can exchange DOGE at the best possible rate on Changelly. What do you think, loyal Dogecoin fans and HODLers? Share your thoughts and predictions in the comment section below.